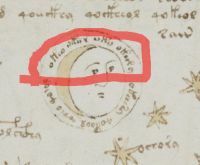 In essence, Andrés offers the suggestion that the folio in question depicts an annular eclipse of the sun that occurred on April 15th 1409 – in other words an event when the Moon covers the Sun’s centre, causing the Sun’s visible outer edge to create an apparent “ring of fire” or ‘annulus’ around the Moon. The event of 1409 was, according to Andrés, visible at its maximum in the north of Europe, and as a partial eclipse in other parts of Europe. e) by similar logic, given that Saturn would also have been very bright at that moment, he suggests that one of the stars of the three opposite, in the Voynich diagram, might be Saturn. He suggests the middle one, though I am not sure why. 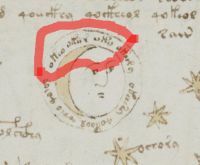 h) Finally, Andrés has another suggestion: “the only astronomer who studied the eclipse of April 15, 1409 was the Byzantine astronomer Jean [Johannes] Chortasmenos, who was the copyist of the Juliana Anicia Codex of Dioscurides, strangely similar to the codex Voynich”, and he wonders if Chortasmenos might be behind the Voynich manuscript as a whole? So what can we make of these ideas? a) the date matches the carbon dating. Ok, that in itself is not conclusive, but it is better to match than not to match. The carbon dating is one of the few firm things we know about the manuscript and it is a very brave or foolish person who goes against it. b) the sun on 15th April 1409 would have been in the constellation of Taurus. See this page for details of the annular eclipse of 1409. It seems to say here that the sun would have been in Aries, so I am not sure how that fits with the Pleiades. 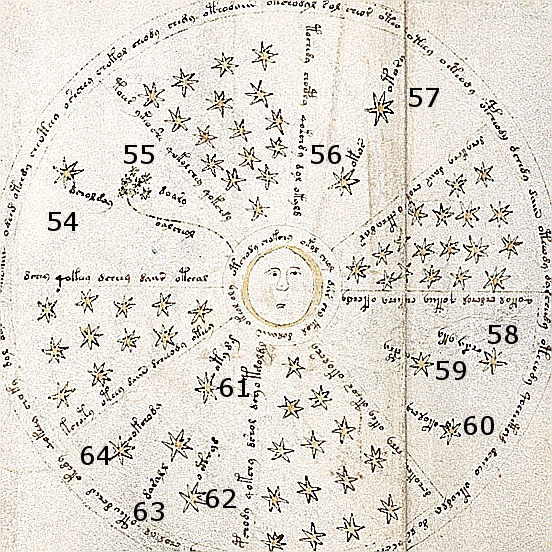 d) the large bright star depicted in the Voynich illustration to the left of the seven stars could be Venus. Yes, it could be, but we need more evidence (e.g. by decoding the word beside it 🙂 ). But Andrés’ discussion serves a useful purpose in reminding us that that bright star might not necessarily be Aldebaran as is often assumed, so other candidates are worth investigating, including Venus. 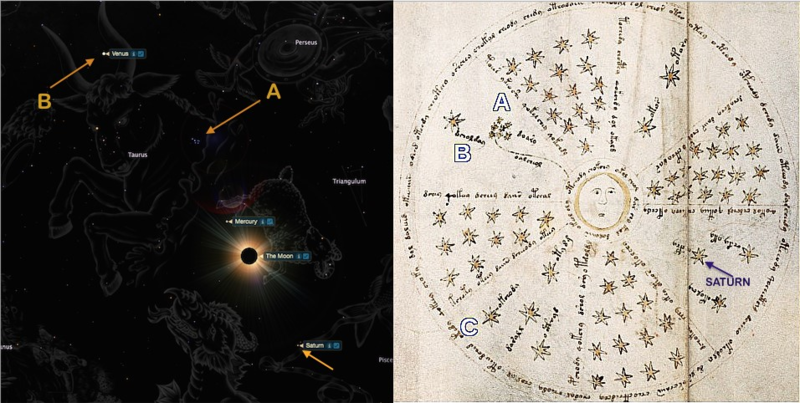 e) one of the stars of the three opposite in the Voynich diagram might be Saturn. I find this a weak suggestion. If there were only one bright star in that position in the Voynich manuscript, then it might be convincing, but the fact that there are three does not support the Saturn idea. f) the zodiac images of Aries in the Voynich manuscript with 15 days in each might link with the date of 15th April. This again is weak to me, as it suggest that the author of the manuscript carried this point about the annular eclipse into other parts of the manuscript, and the evidence for that is weak. g) Evidence across the three pages to suggest the convergence: Again this is weak to my mind, because if the author had wanted to show that relation between the three pages, surely s/he could have drawn it in? I am not convinced by that. h) Jean [Johannes] Chortasmenos as the possible author of the Voynich manuscript. So far as I know this person has not been suggested previously as a possible author of the Voynich (and I hope Diane will tell us if I am wrong!). On the surface his claim is as good as any. Wikipedia does not have a page for him in English, surprisingly [Correction, it has one here, but it is sketchy], but the French one tells us he was an astronomer, copyist, mathematician and scholar, so he could have been as likely as any other. But of course there is no good evidence for it. So in summary, there is a still a lot of evidence needed to substantiate the ideas which Andrés has put forward, but they should not be dismissed out of hand. In particular, I feel that Andrés deserves commendation for offering an interesting idea which at least offers a good explanation of the yellow corona and stimulates thought and investigation. “A” seems to refer to the alleged Voynich solution of Stephen Bax (which has never been accepted by the Voynich community). According to Bax, the word below the “A” means “Taurus”, while the stars left of it represent the Pleiades. i) Andrés never said that ‘A’ refers to my work. He said it refers to ‘Taurus’ which others had identified before me. ii) I never said that my work offered a “solution” to the Voynich manuscript – the clues are in the title of my long paper; my suggestions were “provisional and partial”, and it is sad that apparently intelligent people misrepresent what I said. Group 3: the Voynich Curious – a large group of other onlookers who look and wonder, and are interested, but do not research it much, as is their right. Sorry, Andrés, but you will be attacked a lot by Group 1. I just hope that Group 2 and 3 will at least look at your suggestions with an open mind, and will investigate them further! I, for one, am grateful for your work and hope you yourself will continue to investigate it with an open mind – and not end up in Group 1 like so many before you! I have read some interviews with you, read through the webpage, and as I understand it your mission is to decypher the code. I, on the other hand, have a theory (who doesn’t) on the origin of the book. And possibly it’s author. The geographical information checks out with some previous research and I have some interesting points to why it could be one of those persons I suspect. The only thing I need is someone with a more vast knowledge of the manuscript itself to see if these theories might be something to build on. In 2014, Taschen published “The Book of Miracles” a XVI Century ms written in Augsburg, also known as Augsburger Wunderzeichenbuch. The manuscript is richly illustrated with images of celestial phenomena such as eclipses and comets. This illustration represents a 1483 locust plague and “darkening of the Sun” near Brixen. The illustrations from this manuscript are obviously of a different kind from the Voynich diagram discussed here, still I think they are worth examining. Several pages from the book can be seen on wikimedia. There was a total eclipse 6.10.1241 Thomas of Cantimpré must have seen, just as he had completed his big work on nature – and as they usually come by pairs, another one probably in spring, may be ring-shaped – close to the pleiades again – but I haven´t found a list for that, yet. 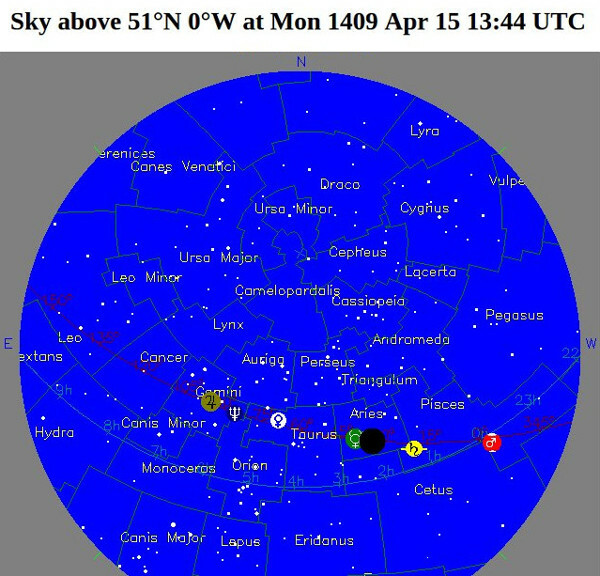 For this date (15.04.1409) we had tropical Taurus but on so called siderical Aries. In 1409 we still had Julian-calendar: no Ingres to Aries at the 21st of March, – in 1409 we had the Taurus-Ingres on 11.04.1409, Aries on 11.03.1409 – For an explanation: the tropical signs of Astrologie always stay the same – thus it was possible, to work the calendars out later, for the astrological tropical was the scale. In 1409 the Julian calendar was still in charge, change came with Rudolph II, late 14th. century – and not everywhere. The fact that Mercury (in green, in the attached image) was close to the eclipsed sun opens another possibility. 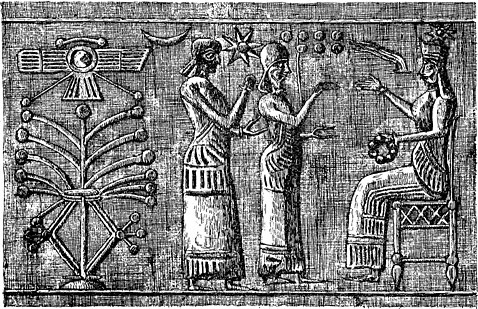 Encyclopaedia Iranica mentions a “Pahlavi tradition which assumes that Tištar [or Tashter] and Tīr [Mercury] were the same being.” The star labeled B in Andrés’ diagram and identified with Tištar by Stephen and Derek could then also be Mercury (in addition with the two more common identifications for Tištar: Sirius and Aldebaran). I think the only way to prune some of the possibilities would be to make sense of some of the other labels in the diagram. We seem to be saying that the single star depicted by the seven stars, which many have suggested might be Aldebaran, could equally be Venus or Mercury. And as I see it, Markus is disputing the suggestion that Saturn might be one of the three stars in the Voynich diagram ‘opposite’ the supposed ‘Taurus/Aries’ segment. a) the three stars in that opposite segment, at the bottom left? b) Or two others which might match those in the top right? c) Or the four in the bottom left? 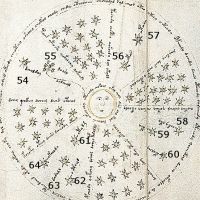 If the Voynich artist was, or was following, a careful astronomer, it might be that these bright objects have been drawn in the correct positions relative to the Aries/Taurus segments, as they appeared (supposedly) in 1409. That would be interesting, no? it takes a few days, to really get in position, but sometimes new fresh thoughts will bring inspiration. Thinking about your questions about the star names in sought places, I found: the last on the top right is very similar to the one and only named on the “mars” pisces “chart” (70v), so I looked for a name, important for the ancestors. First of all, the symbol of pisces is not drawn the correct way: usually the fish themselves are not in the centre of the iconic picture, but at the end of the fishing rods, this gives a note to little sloppiness of the artist – one of the important stars there in “Al Pherg”, also called “Kullat Nunu” – with little combination one can find this name Alphora(z) by a description from Thomas of Cantimpré, a scholar of Albertus Magnus, author of liber de naturum rerum. Now if you read the name of the star in 70v, it´s not coded at all. The very small “Alphora(z)” was interpreted as a picture of Christ himself, reborn from eyes and head. If you count all the stars in the closed section – they are 60 in total number – if I am not wrong – the others are 1,2,3 and 4. 60 is the rhythm of Saturn and Jupiter, forming the salomonic seal in the sky, 4 is the number of materialization, getting on earth, being real: also “many”. Except the Pleiades with the rope connecting it with the Eclipse, we must therefore not necessarily look for the fitting constellation, but for a process, unfolding in time periods of 4 and 60. So far these thoughts, hope they are helpful – I will be back with other examples within a few days. 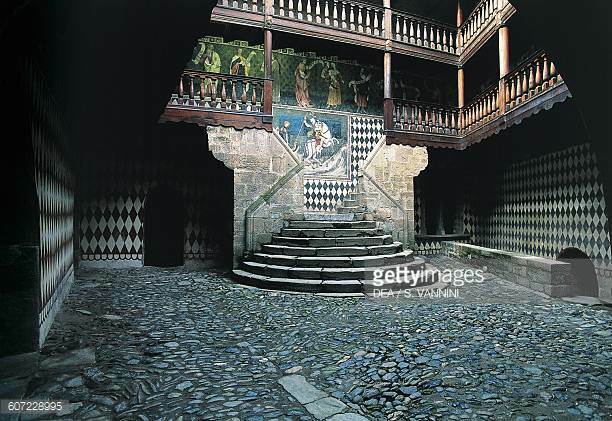 I am a housewife and a ‘history’ novice, but am intrigued by ancient history and mystery, particularly Egyptian / Ancient worlds material on Youtube, just for pleasure, and ‘watch’ programmes in preference to reading. Some time ago I saw the Voynich Manuscript on a tv programme and a few days ago Youtube listed it as recommended viewing. Your name and work has been highly recommended by some of the people posting videos relating to the Voynich Manuscript. I’ve not seen the whole manuscript and haven’t studied the writing of the manuscript, but I like the pictorial aspect and particularly the stars. Over the past few days I have been watching Zodiac/astrology videos, etc (including Santos Bonacci). One of the videos I saw online mentioned number of days between the equinox/solstice, etc, eg 94, 90, 92 and 89 which took my interest. I have been looking at one Voynich chart for several days/almost a week and I feel rather elated following a few basic calculations this morning proved pretty amazing. Wow! The chart is not folly but has meaning. I have no clue as to the wording, but the ‘star’ pie chart (plate 68r3 ?) is divided into 8 portions that appears to be seasons (1, 2, 3 and 4 stars), with each alternative slice containing a number of stars, eg 16, 18, 14 and 11, with a combined total of the latter of 59 stars. What is the significance of 6.1864406? Appears to be the vital number, although I know not why but it was true of for similar formulas for the reproduction of the Antikythera mechanism. What is the significance of 1 star? What is the significance of the central picture? This is all my own work and I may be repeating common knowledge but I thought to bring it to your attention should it be relevant and helpful to the Voynich Manuscript studies. I haven’t delved too much into the Voynich discoveries available online. Just some thoughts. Probably a long shot, but it occured to me, depending on how many planets were known when the Voynich Manuscript was produced. Could the single star be the sun (although here it would be small in comparison to the picture of the moon in the centre. The sun is displayed as the same size, with a face, on other astrological pages). Could the group of stars be planets (no idea of the wording). Maybe the single star represents the Earth as in the old days the Earth was deemed to be the centre of our galaxy, and the sun revolved around it. The wavy line could be the ecliptic path?? I know nothing – it is just a thought and probably completley wrong, but worth a mention. Maybe a fresh idea? April 15 is part of the month of Aries, but just a few days before it ends (April 20) and Taurus begins (April 21). And the computer-generated image clearly shows the sun’s location in the empty space adjacent to both constellations anyway, so a debate over whether to say it was “in” one or the other would be pretty moot semantics. And the 12 Zodiac months are divided pretty evenly across the year and associated with signs in the sky that are designated to be of a consistent 30° size regardless of the sizes of the constellations, how much time the sun spends geometrically located in any one of them, or when it moves out of one or into another, without any acknowledgement of empty spaces between them. So sometimes the sun is geometrically located in one constellation but said to be “in” another one’s sign on the calendar. I don’t know whether there are any dates late in the month of Aries when the sun is actually in the constellation Taurus or not, but it seems plausible because Taurus is a bigger constellation than average. Either way, though, saying it was in Taurus at the time is no worse than an honest mistake from looking at images showing how close the sun was to a prominent Taurine feature, the Pleiades, and having Taurus on one’s mind. The point is that it was close enough to the Pleiades for a drawing of an ecliptic ring of fire near a seven-star cluster to make sense. Venus would have been between the bull’s horns, just above its face, which puts it pretty close to Aldebaran, the eye of the bull, which has also been called “Tashter”, “Taschter”, “Tascheter”, and such. 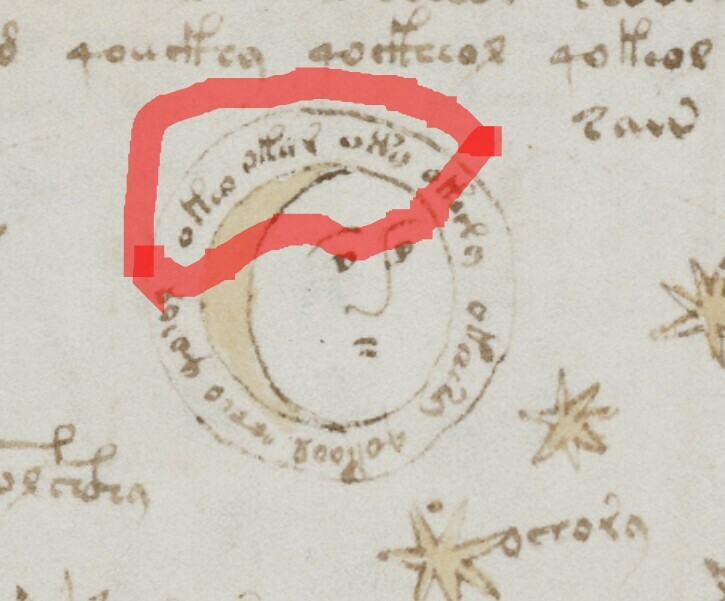 The Voynich label for that other star next to the cluster of seven looks to me like ^taštwn^. The text ring around the moon includes ^agas,eges^. This is a word I had thought should mean “day” based on how often it appears in labels for one of 30 icons surrounding a central Zodiac-like image on other Voynich pages. Later, after coming to the idea that this language is related to Romany, I found out that “e ges” in Romany means “the day” (ges=day, e=the). I now expect the whole text ring here to be a sentence such as “the sky was dark in the middle of the day”. Still pretty good, though, especially considering that one of the patterns I’ve talked about before was ^w^ where “r” might be expected where a root word meets a suffix, which could make ^thaštrn^ a legitimate substitution. A little bug about this idea is that the main interpretation of the label for the seven-star cluster has been as some version of the word “Taurus”, and it wouldn’t seem to make much sense to have two parts of Taurus next to each other with one labeled “Taurus” and the other named as the separate individual part. One possible response to that is the fact that there have been very many known cases of names jumping between a prominent star, small group of stars, and/or constellation, so any one of them can end up with another’s name. But there’s another one that involves resurrecting a fact that hasn’t been talked about around here much since Bax’s Voynich phonetics article three years ago. Arabic has not only ثور “θwr” (“Thaur”) from an Indo-European language for “bull” as the whole constellation, but also an unrelated but coincidentally phonetically similar name for just the Pleiades alone: ثريا “θrya” (“Thuraya”). And, in light of some other signs that EVA-R might equate to the English consonant [y] at least sometimes (letter [j] in most other European languages, IPA /j/), the Voynich label for the Pleiades could be read as ^tãwyn^ (or ^tãwyᵃn^ with an implicit vowel accompanying the [y]-consonant). And if we read that label as related to the Arabic word for “Pleiades” instead of to “Taurus”, then there is no problem of part of Taurus getting the whole thing’s label; we would just have two parts of Taurus side by side, both labeled as only a part of it. Oops again: that’s not ^eges^ but ^ekes^… which, now that I realize I did that, is I think the same mistake someone else here made once before, and I was even the one to correct it back then! Thank you very much for presenting this theory, Stephen! I searched GoogleBooks and found that Science and Eastern Orthodoxy: From the Greek Fathers to the Age of Globalization by Efthymios Nicolaidis dicusses Chortasmenos’ observation of the april 1409 eclipse. A footnote points to two manuscripts: Vat. gr. 1059 fols 251-53 and Urbinas gr.80 fols 105v-106. I have no knowledge of Greek and I cannot read anything from these. Years ago we discussed an eclipse diagram from the Spanish “Tratado de astrología” ms BNE RES/2 as comparable with f68r3. On the basis of this and other parallels, interpreting the diagram as related to eclipses seems very reasonable to me. Also the idea that some of the 10 labeled stars might represent planets instead of fixed stars is well worth exploring. A detail of Andrés’ theory that is unclear to me is the meaning of the label C in the lower left quadrant of the diagram. As always, until we make progress with the reading of the labels, it remains impossible to be sure of the specific interpretation of a diagram. The circle surrounding the moon is indeed an unusual feature: the annular eclipse is a very interesting interpretation. 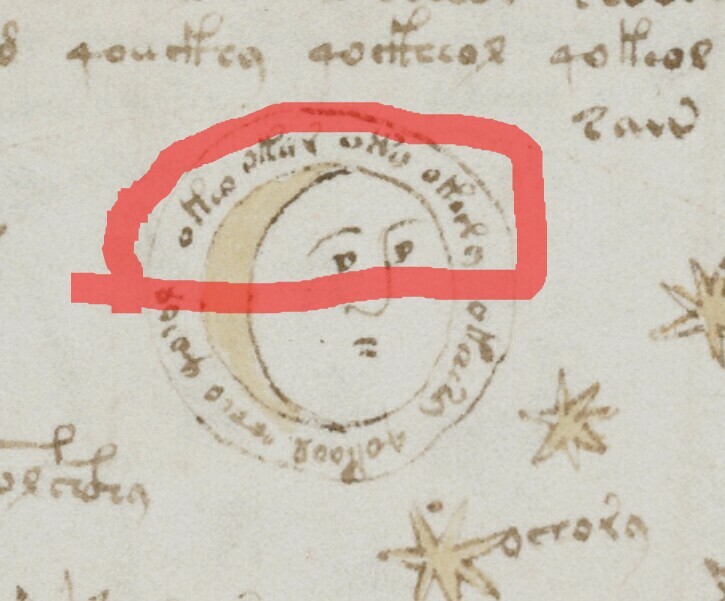 The only parallel for this detail I can remember at the moment appears in Arundel ms 501: the moon at the bottom is labeled “Nox” (night) and marks the North (Septentrio).